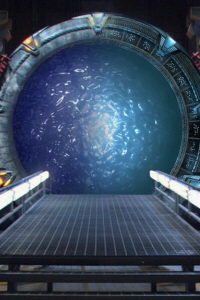 For the third time that day, the stargate received an unscheduled dial-in. It was getting worrying. This time, though, the dialling sequence completed as expected, and the iris was set in place. The rippling reflection of the wormhole could be seen against the back wall of the gateroom, and the technicians waited with bated breath. Major Davies raced in... and waited. The minutes ticked past, and, three minutes after the wormhole activated, a burst of static, and the Tollan code was received. The technician frowned, and Major Davies scowled. "Don't open the iris," he barked, wanting to make sure that this was what it appeared to be. For the Tollan code to have come through twice in one day was unusual, but, coupled with everything else that had been going on, it could be real cause for alarm. Another minute passed, and the code was retransmitted from the other side, along with a radio message. "To our Tau'ri friends: this is Narim of the Tollans, requesting safe passage to your facility, and for an audience with your General Hammond. I understand that you have had difficulties today, and I believe that we are in a position to enlighten you. Regrettably, the primary reason for this contact is to request your help. As a show of good faith, I will dial back in precisely five Earth minutes. I would urge you to consider allowing me an audience with your General Hammond. We may be of use to one another." And, just as suddenly as it had opened, the wormhole sploshed closed. The control room was tense, and Davies immediately got on the phone to Hammond's office. The General appeared to have stepped away, but he was assured by his assistant that an audience could be arranged within the hour, as long as the call had been genuine. And then came the wait. Exactly five minutes after the wormhole had closed, the dialling sequence initiated again. The technician slid the iris into place - just in case - but there was no need. Immediately, the Tollan code was received, along with another radio message. "I thank you for listening. Please advise whether I have been granted an audience. I will await your signal to come through the wormhole." The transmission ended, and the technician looked to Davies for permission to open the iris. A curt nod, and the technician punched the button. The titanium iris drew back, its familiar metallic swish filling the gateroom. Moments later, Narim emerged from the wormhole, looking more than a little worse for wear. His voice, while urgent, had given nothing away, and it was clear that a calamity had befallen the Tollans. His face and clothes were dirty, his tunic torn in a number of places, and he had a haunted look to his eyes. "Close the iris," he shouted, glancing back at the wormhole as though he expected someone to come through behind him.